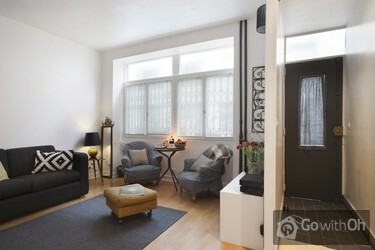 This charming 35m2 apartment used to be a flower shop. 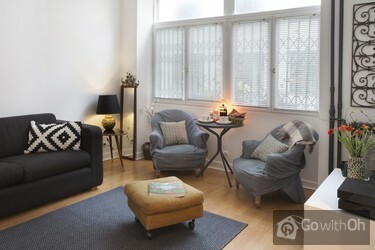 The property is located in the picturesque and peaceful Butte Bergeyre area five minutes from the 19th century Buttes Chaumont park and is situated on the ground floor of a small 1930's building with a cosy and inviting atmosphere. Tastefully decorated in French retro style and designed to accommodate up to 4 people, the apartment features a living room with a sofa-bed for two and dining area, a fully-equipped independent kitchen and a comfortable bedroom with a double bed. 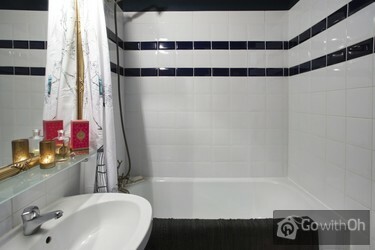 The charming bathroom features a bathtub that is ideal for relaxing after a long day exploring the capital. You will have a full range of equipment at your disposal, including a flat-screen television with cable channels, a DVD player, internet connection (Wi-Fi/cable) and an iPod dock. 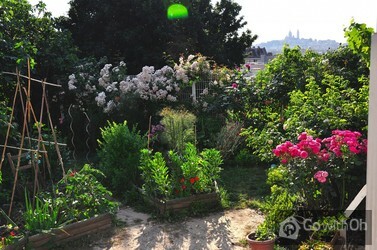 And if you have time you can visit the shared garden with its own beehives and beautiful views of the Sacré Coeur. 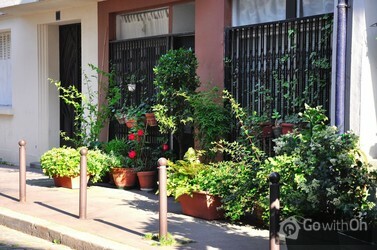 This property provides an ideal balance between city and tranquility. 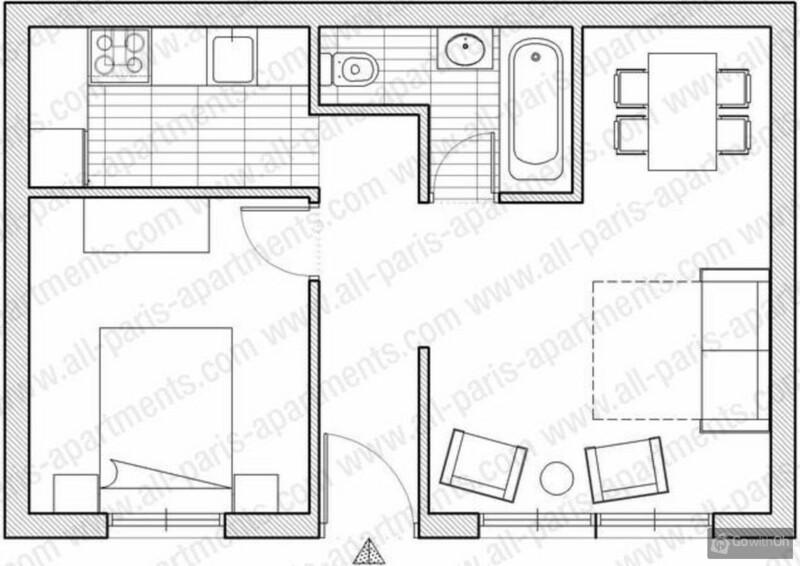 The Colonel Fabien metro station (line 2) is located just 4 minutes walk away. A direct line to the romantic Basilica of Sacre Coeur, the Père Lachaise cemetery and the worlds most famous avenue, the Champs-Elysées. You will have no problem finding lively bars and restaurants close by on the canal front, as well as traditional food shops (avenue Secrétan) where you can get a taste of real Parisian life. Check-in between 15:00 and 22:00. Late check-in after 22:00 available for a cost of 50. Check-out between 08:00 and 11:00. Early check-out before 08:00 available for a cost of 50. It is possible to obtain an iron, a fan on request at no extra cost (please confirm availability with the owner prior to arrival). Cot on request with an extra charge of 15 for the whole stay. 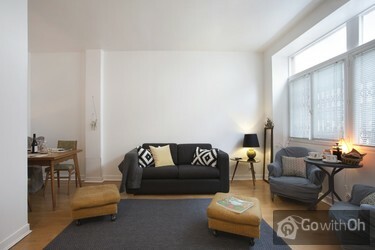 Great location in a quiet area; ideal since there are several underground stations to chose from. Very kind landlady who ensured we felt very welcome and comfortable during our stay. Alloggio molto accogliente, arredato con gusto, con tutti i confort eccetto la lavatrice, molto gentile la proprietaria che ci ha fatto anche avere la macchina per il caffè!!! Unico difetto: le pentole e le padelle! Poche e per la maggior parte vecchie e non di buona qualità, ma per il resto tutto... perfetto. La collocazione era ottima, la strada silenziosa e la vista stupenda! Ci torneremo sicuramente!!! 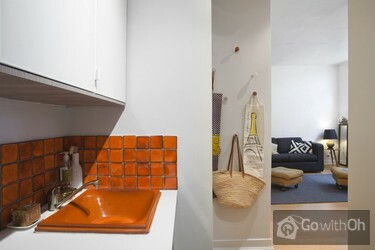 A very nice and gosy apartment, we went as family(2 kids 13&18) by car, we parked our car in a garage at Riquet ave., different metrostations close by, so you could travel very easily to the hot spots of Paris. 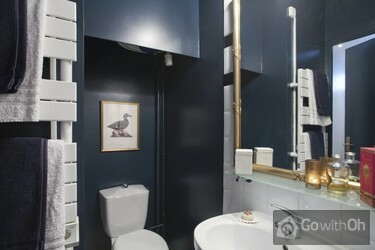 We had a very good time at this accomodation, very quite but close to real Paris!The Netherlands. Close to metro station. Silent. Clean. Supermarket nearby. Beautiful park in 3 minutes walk. Great thanks to S. for assistance. A very friendly, helpful owner. A unique and surprising little corner of Paris - very close to everything but in a world of its own. The flat itself is excellent. Highly recommended. 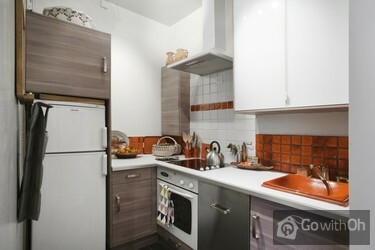 The small and nicely decorated appartment is equippped with all necessities, as a fully equipped kitchen etc. 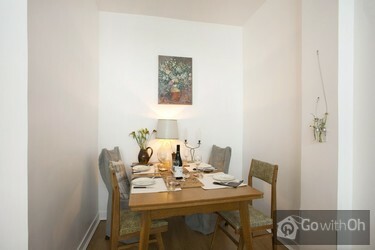 It is located in a nice area with beautiful views over paris and close to the park. You should be well on foot, because ist is a few steps up. 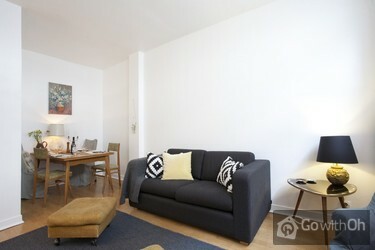 The appartment is located in walking distance ...to Metro and all shopping (especially an excellent boulangerie). Very nice host as well. If I could go more often I would rather keep it to myself than recommend it. This apartment is set in a lovely quiet location, and although there are a lot of stairs to get up to the hill it's on, it's worth it when you get up there! The furniture is all comfortable and S. is very welcoming and helpful. We thoroughly enjoyed our stay and would stay here again if we head to Paris for another visit. Wie hatten einen sehr schönen Urlaub in Paris. Danke an S unsere Gastgeberin für die tolle Zeit. Die Wohnung ist in zentraler Lage und die Metrostationen sind schnell zu erreichen, trotzdem ist es wunderbar ruhig! Die Wohnung liegt auf einem kleinen Berg und daher vom hecktischen Stadtverkehr ...ausgeschlossen. Es ist alles vorhanden was man für eine Woche Paris benötigt und sehr sauber und ordentlich. Wir waren sehr zufrieden! Sophie went out of her way to help us through some difficult communication problems which we truly appreciated. With this sorted we were able to continue our travels through France. We felt like at home in this very nice "flower shop", many thanks to S.! Ich mag lieber in einem privaten Appartement wohnen als in einem Hotel - deshalb: toll, dass es Sie gibt! The flat is home to an eclectic range of contemporary art and home furnishings. There is a block of flats next door and a number of steps to mount to reach the flat (75) but there is probably no better apartment within walking distance of the inspiring parc buttes chaumont! OK place to stay. Cash deposit required by company was extremely high and meant very large amounts of cash taken away and bought back. Would have preferred to have paid balance for department online or had deposit held from account whilst away or ideally both. 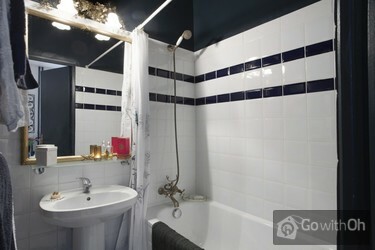 S the owner was very friendly & helpful with local information, the apartment was very well equiped and we had a really pleasant stay in Paris. It was like having a home away from home. The owner was very helpful in accomodating a later than expected arrival due to delayed flights. Das Quartier ist ganz etwas besonders spannendes. Es ist oben auf einen kleinen Butte (flacher Hügel), von unten/aussen sieht man es kaum. Zugang via drei Treppen und eine kleine Strasse mit Haarnadelkurve - Gratisfitness inbegriffen. Wirklich sehr ruhig, überhaupt kein Strassenlärm. Vorne an der Strasse eine prima Aussicht auf Montmartre-Sacré Coeur! This is a fabulous location. The apartment is small but comfortable. Excellent working table in the living/dining area. Das Appartment hat ein sehr schöne Lage, wirklich etwas besonderes!Sogar fuer vier Personen ausreichend gross.Ueberhaupt sauber und gemutlich wirklich zu empfehlen! Posizione dell'appartamento super, pulito ed arredato con gusto. Quartiere tranquillo con negozi a 5 minuti e Metropolitana a 7 minuti. Consiglio a chi vuole tranquillità e silenzio. Parco a 2 minuti ideale per Pic-nic serali!!!! Consiglio vivamente!!! Labai gera vieta. Tylu. Tik nesitikekite penkiu zvaigzdziu. 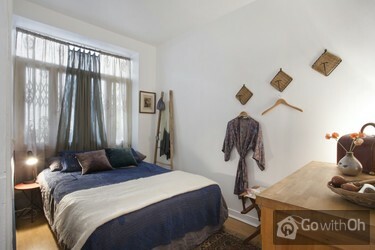 Appartement propre et bien situé dans un secteur tranquille. Facilité de communication avec la personne de contact. Had everything we needed and basic supplies such as tea/sugar/milk so could relax on arrival and not have to rush to a supermarket. Wonderful view of Sacre Couer from the end of the street. Pleasant, quiet area. Leuk en gezellig appartement!Doordat de omgeving een apart hogergelegen dorpje is, is het er heel rustig en heb je een mooi uitzicht met zonsondergang over Parijs. Casa ben arredata, molto funzionale e attrezzata,quartiere molto tranquillo e silenzioso,negozi vicini anche la metro.Sophie molto gentile e accogliente. Es war alles bestens, wir waren mehr als zufrieden mit der Unterkunft. Alles perfekt! Wohnung sauber, ruhig gelegen, geschmackvoll eingerichtet. Volle Punktzahl! 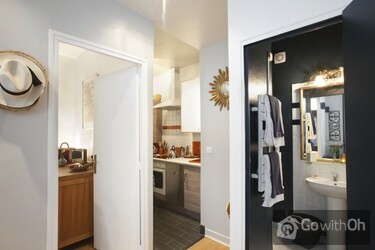 Prima en leuk gelegen appartement (in een "dorpje" in het 19e arrondissement) met alles wat nodig is voor een prettig verblijf voor twee personen. Goede verbinding (bus 26) met Gare du Nord. Moderne smart-tv installatie met o.a. wifi. Erg vriendelijke en attente eigenaresse.Helaas twee negatieve ...punten: de twee fauteuiltjes zijn erg laag en zacht, en ook het zitcomfort van de (bed)bank vonden wij onvoldoende..Het bad is klein (ca. 130cm). L'appartamento, benche' sia l'adattamento di un fondo a piano terra, e' abbastanza carino e funzionale per una coppia con due figli. 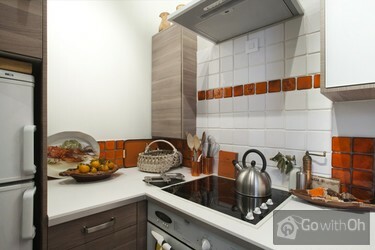 Cucina attrezzata, arredamento spartano ma accogliente, ambiente pulito. La posizione e' stata una piacevole scoperta per noi, una zona di Parigi poco turistica e ...molto carina con una meravigliosa vista sul Sacro Cuore. A poca distanza ci sono luoghi di una certa rilevanza come il parco di Butte Chamontes ed il cimitero di Pierre Lachaise che meritano senz'altro una visita. Zeer mooi, een goede uitvalsbasis in een gezellige buurt. Met zorg ingericht appartement. De verwarming die niet regelbaar is, is een nadeel (het was er te warm). Lovely neighborhood and our host was excellent and very attentive. The apartment had everything we needed (although perhaps a washing machine would be useful for longer stays). The Park Buttes Chaumont is charming and very near by. The bed was very comfortable. Please note that I had the ...impression from the website that the shared garden was off the apartment, but this is not the case - it is at the end of the road. De ligging is echt heel fijn. Winkels en metro dichtbij. Het wijkje waar dit appartement in ligt is rustig en voelt vertrouwd. Die Wohnung war sehr gemütlich und geschmackvoll eingerichtet. Das Wohngebiet ruhig, besonders die Nähe zum wunderschönen Parc Buttes au Chaumont hat uns sehr gefallen. Boulangerie, Metro und Supermarkt ganz in der Nähe. Der Blick am Ende der Straße auf Sacre-Coeur einfach wundervoll. Wer nach ...dem Besuch von den Pariser Sehenswürdigkeiten Ruhe sucht, ist hier genau richtig. S ist eine gute, sehr freundliche Gastgeberin. Wir wurden sehr freundlich empfangen und haben uns im Appartement sofort wohlgefühlt. Die Vermieterin, Sophie Harward, ist ausgesprochen nett und gibt auch gern Tipps für Unternehmungen in Paris - gerade auch über die Haupttouristenattraktionen hinaus. Informationsmaterial liegt auch im ...Appartement aus, in dem wir uns nach vielen Besichtigungen wunderbar erholen konnten. Das Appartement liegt sehr ruhig. Supermärkte, Bäcker, Buchhändler, Restaurants sind aber in fünf Minuten zu Fuß zu erreichen. Noch dazu hat man eine Minute vom Appartement entfernt einen herrlichen Ausblick über Paris zum Montmartre-Hügel. Wir würden das Appartement jederzeit wieder buchen. Alles prima. Die Wohnung ist wirklich zu empfehlen. Ons verblijf in dit appartment was zeer aangenaam.prima voor ons en onze twee kleine kinderen (1 en 4)Alles wat goed te bereiken via de metro en een winkel voor boodschappen was in de buurt! Onze gast vrouw was zeer fijn en wist ons van alles te vertellen. Ik raad dit appartement zeker aan voor kleine gezinnen. Al was de weg erna toe redelijke klim! Die Wohnung liegt unglaublich ruhig, in einem sehr netten Wohngebiet mit fast dörflichem Charakter. Öffentliche Verkehrsmittel sind gut zu erreichen. Und man hat einen tollen Blick über Paris. Wonderful,quiet location. Metro stations nearby. Apartment very clean and well set up for couples. Would highly recommend it to friends. un apartamento lleno de detalles exquisitos, que la propietaria S cuida con cariño, igual que a los visitantes. Die Wohnung lag in einem guten Wohngebiet, eine nette Umgebung, am Ende der Straße Blick auf Sacre Coeur und über Paris.Die Wohnung selber ist sehr individuell eingerichtet, einige Möbelstücke jedoch schon sehr abgenutzt und schäbig, hier täte eine Erneuerung dringend nötig. Die Wohnung war sauber und gut ausgestattet. 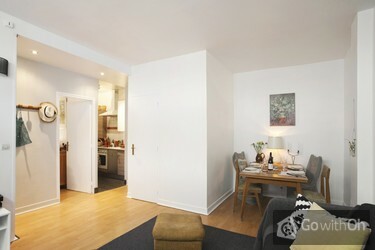 Das Appartement hat eine sehr gute Lage, ganz nah am Parc des Buttes-Chaumont. Die kleine Wohnstraße ist wirklich ruhig, hat fast einen "dörflichen" Charakter. Das Appartement ist gut ausgestattet, alles da, was wir gebraucht haben. Die Vermieterin ist ausgesprochen freundlich und zuvorkommend. Wir haben 4 Nächte in dem Apartment gewohnt und uns dabei sehr wohl gefühlt. Die Lage ist ausgesprochen gut in einer ruhigen Straße mit sehr netten Nachbarn. Sophie ist eine wunderbare Gastgeberin. Unser Paris-Aufenthalt war perfekt! Vielen Dank dafür! !